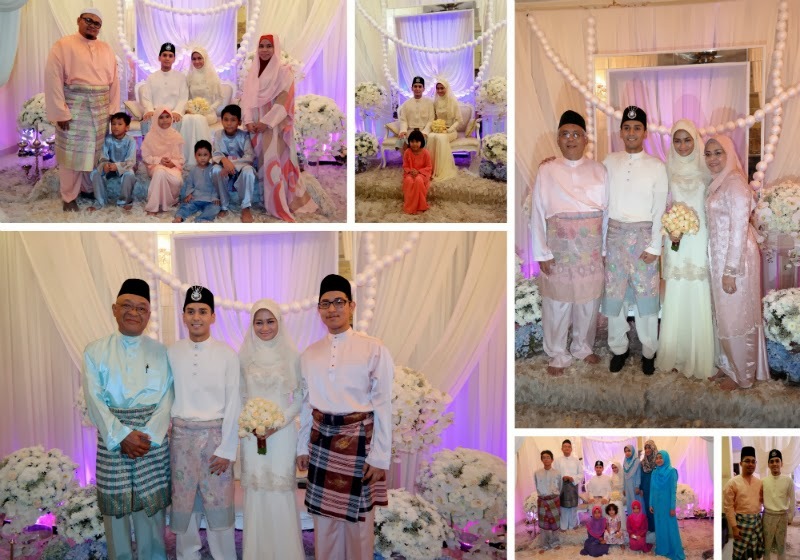 1st December 2013 was a historical date for my family as it was the date of the second wedding amongst cousins on my mother's side and we received a new member of the family. Last Sunday morning was the solemnisation of my dearest cousin Amira Suraya to her high school sweetheart of 12 years, Reza Ikram. You see, I have 40 younger cousins on my mother's side. Uhuh. Forty. First. Cousins. My mother has 11 siblings and I am the eldest of all of my grandparent's grandchildren. Yeah. 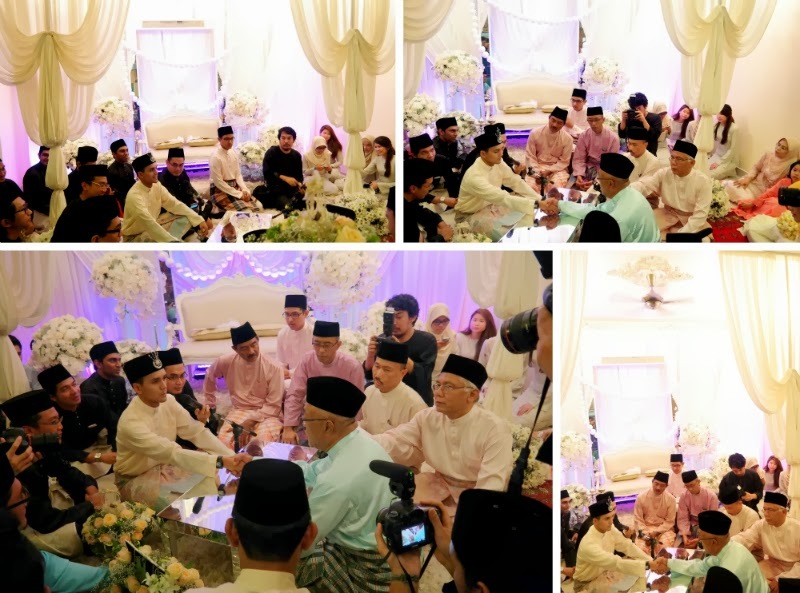 Since I was the first to get married, this was a very much anticipated event by all the relatives because it was only the second marriage among us cousins. The day before the wedding , most of my aunts, uncles and other cousins came to Mira's house for a majlis doa selamat and also to help out with some of the preparations before the big day. Our Atok came all the way from Perak too. 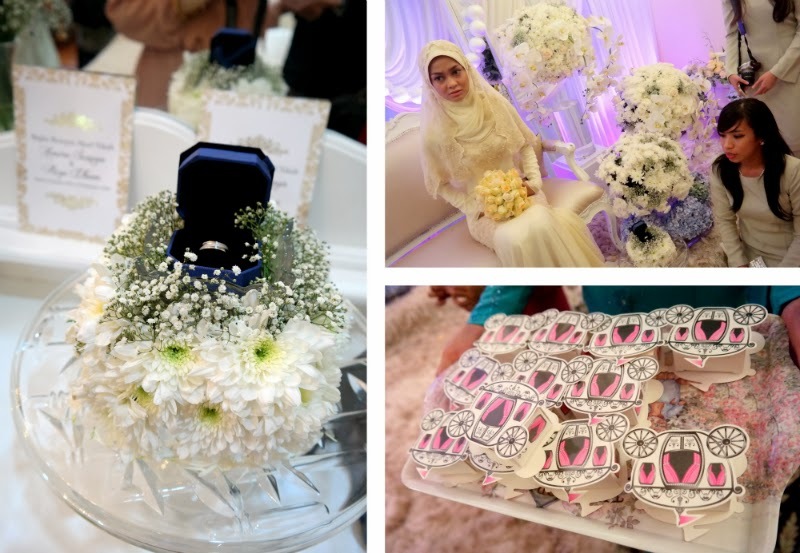 I remember Mira came back from Australia when she was studying there to attend my wedding ceremonies in July 2010. She even performed in front of 1200 guests at my wedding reception! On my mother's side, we were very close and did a lot of silly stuffs growing up together with another cousin, the sweet Zalikha Anas or Ika. As you may have seen me mention countless of times, Mira was the person who pushed and encouraged me to blog more seriously. 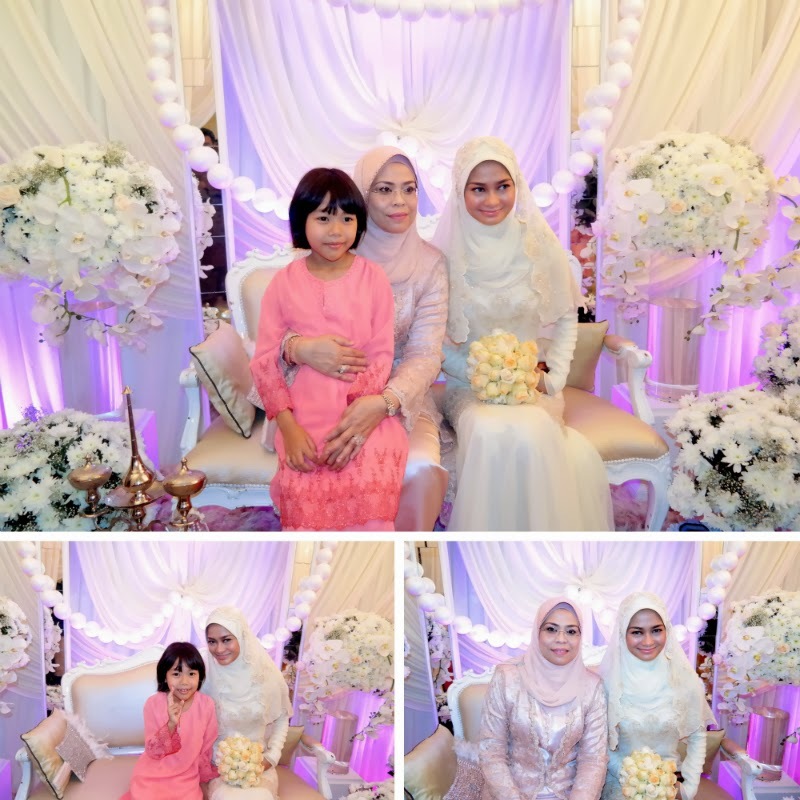 Since I'm doing this post, I found some posts Mira wrote for my wedding : Sabrina's Aqd Nikah and Sabrina's Reception. If you like my blog, then the person who you should thank is Mira (haha) as she was the one who told me to make it public and start to write more. That was way back, I think 3 years ago. I was told that family would have to wear peach so I wore a short, dark peach-y dress and matched it with a Yadotsa kurung skirt with a PariPari shawl. The whole look was completed with my mother's vintage handbag. 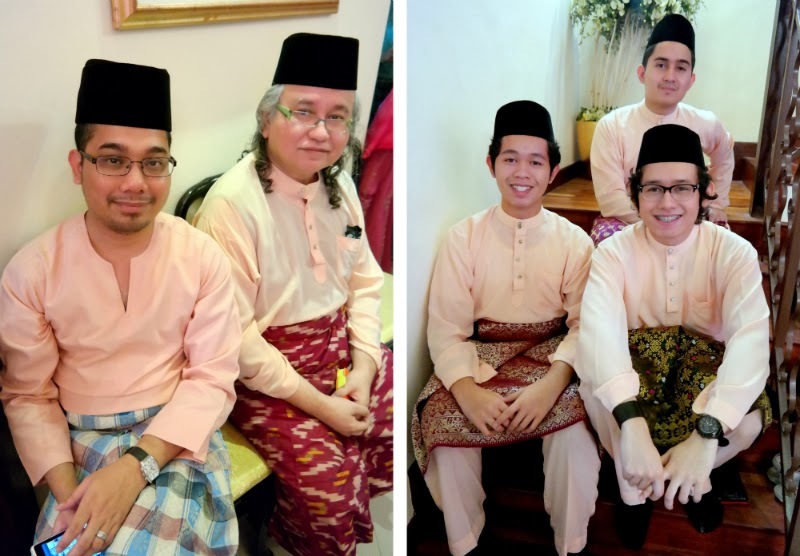 Thankfully the husband has a Baju Melayu (Malay traditional outfit) to match mine. We arrived early that morning and when I was about to go into the house, I bumped into Najeeb Azami who had just finished getting Mira ready with her makeup. It's good to see Najeeb as he also did my solemnisation makeup. Brings good memories. 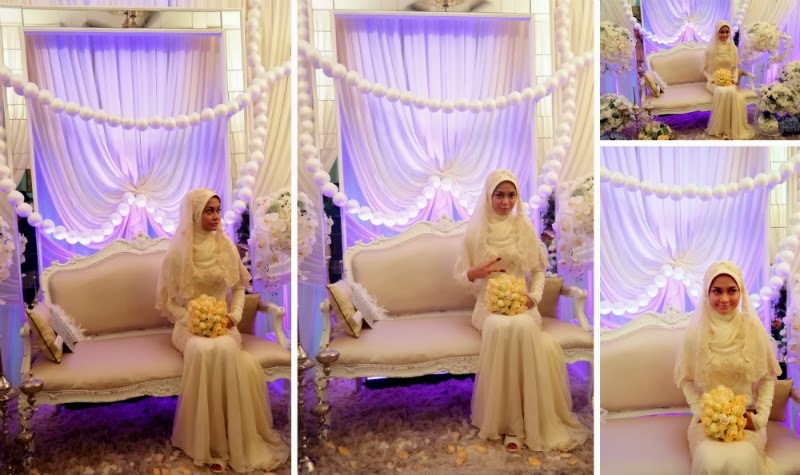 (see Wedding Photos & Video) When I met Mira she was all ready with her makeup and wedding outfit. She looked absolutely gorgeous. From head to toe, everything was perfect. So enjoy some of the pictures of the solemnisation ceremony, including some pictures before the event. I had a great time meeting with all the relatives. It is not easy to meet everyone but during weddings we usually get to meet almost everyone. I did receive few comments from distant relatives asking me when i will get pregnant again and when I'll have a baby to bring to events, but Alhamdulillah and I can just reply God knows best and I'm thankful and grateful for the gifts that I already have. There are a lot of things that human beings cannot answer as only God knows best. I already have one child in heaven, my Putri Jibrael Zumirrah and I'm extremely thankful for the gift by Allah. All praises to the Creator. Mira with her lovely bridesmaids. My beloveds. My husband, my father and my younger brothers. I managed to capture the solemnisation moment via video too. After that we took lots of photos at the pelamin before having our lunch. I must say that I enjoy my lunch very, very much because they served my favourite dish gulai tempoyak ikan patin and it was cooked by my late Opah's sister, Opah Chu. She is one of my all time favourite caterers and our family normally hires her for events. Her food never disappoints. I had my tummy filled. Alhamdulillah. My VIP, Atok. Jibrael's great grandfather. As I am his first grandchild, Jibrael is his first great grand child. Anyway, to Mira and Reza, I am truly very happy for both of you. :) From highschool sweethearts 12 years ago and now husband and wife! May Allah bless your union and may the both of you be blessed with love, contentment and strength to weather the challenges in life together till Jannah. May this union bring you closer to His Love, the ONE who created Love. Congratulations again! Take good care of my cousin Reza! I know you will. Welcome to the family. Much love to both of you. I like your camera. Makes everyone look flawless. Shall bother you soonest for the pics. Anybody close to Amira would know she HATES it when people call her 'Mira'. Cheers! Reza ni dulu study UTP ke? Mcm penah tengok die ni. Coz your cousin zalikha tu ex-UTPian kan. She's my junior. To fikiran terbuka. Namanya dah cukup molek. Fikiran terbuka. Tapi sejauh mana fikiran terbuka itu? Perlukah di comment on every post tentang satu sahaja post rnadia? Berapa ramai lagi yang menutup aurat dengan tidak sempurnanya? Berapa ramai lagi yg masih terbuka auratnya? Sekalipun berfikiran terbuka, menegurlah dengan cara berhikmah. Satu comment cukup utk memberi kesan. Tak perlu terhegeh2 memberi comment bertalu2 . Kasihan saya melihat anda yang berfikiran terbuka tapi tidak tahu cara untuk memberi teguran. Sekian. Saya tidak nampak dimana silapnya pakaian Nadia.. tudung tidaklah singkat, baju pun longgar.. Saya tidak pasti entah bagaimana yg dimaksudkan berfikiran terbuka ini..